Living my vest life over here! 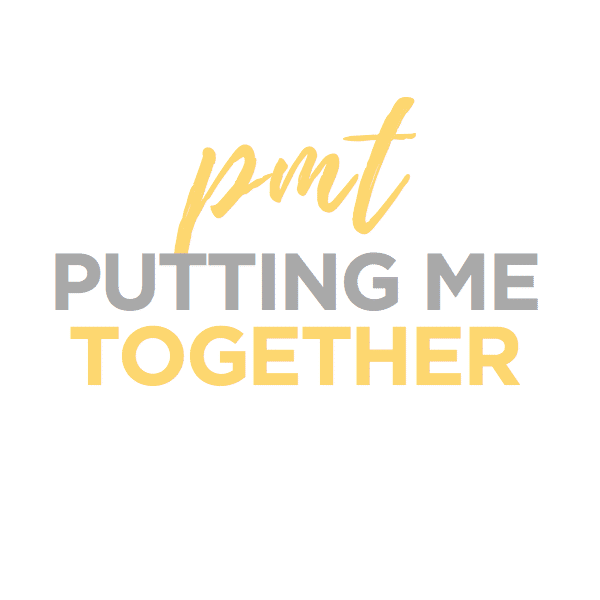 If you’ve been around PMT you know that a utility jacket is one of my long time closet staples, and a utility vest is its trusty sidekick! I’ve been sporting a utility vest since 2011 when I realized how awesome they are. 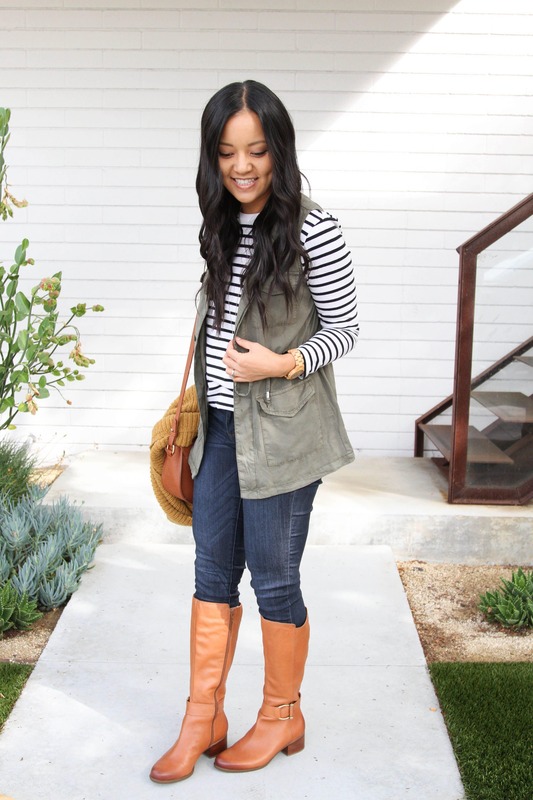 Today I want to show you a few ways to wear a utility vest to give you some ideas! 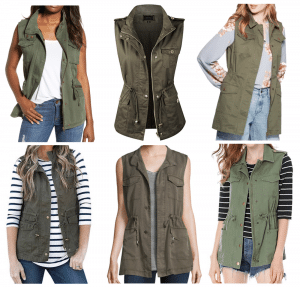 I’ve said many times that what I love about both utility jackets and vests is that they are durable and have large pockets, which are great for momming it. 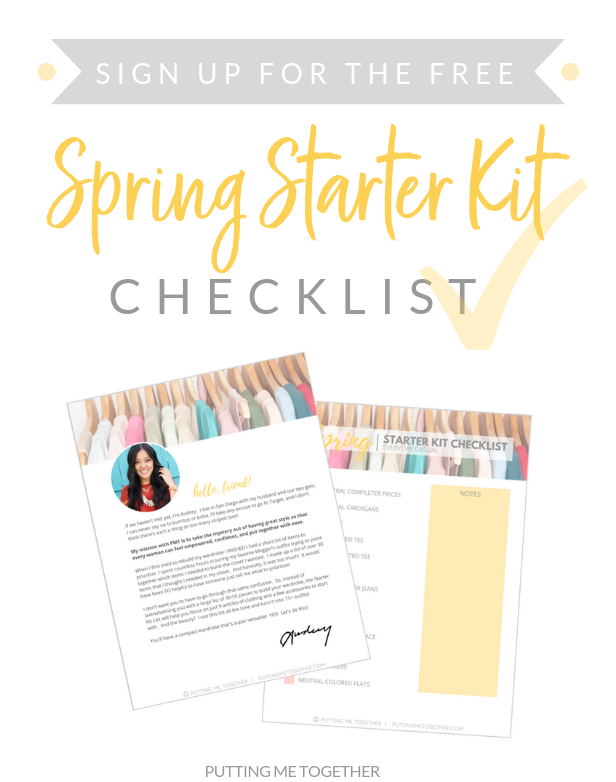 They also provide structure and shape to flatter your figure and also pull together outfits. Lastly, they’re incredibly versatile. 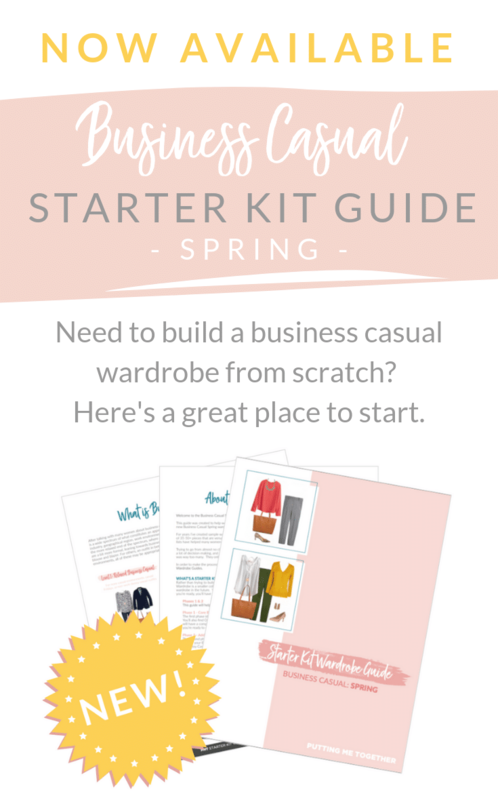 They can be worn with nearly anything, and they provide an extra layer and make outfits more visually interesting. 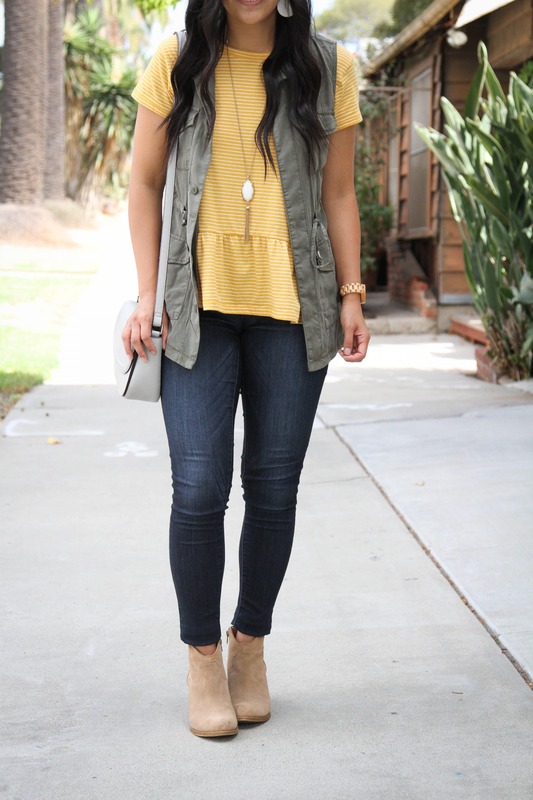 Utility vests are especially great for warmer climates. They allow you to have the visual interest of layering while not overheating you. Utility vests come in all different weights (thickness/thinness of material), so if you’re in a super warm climate, look for a really thin one. If you’re in a cooler climate but still want to wear a vest, look for a thicker one. 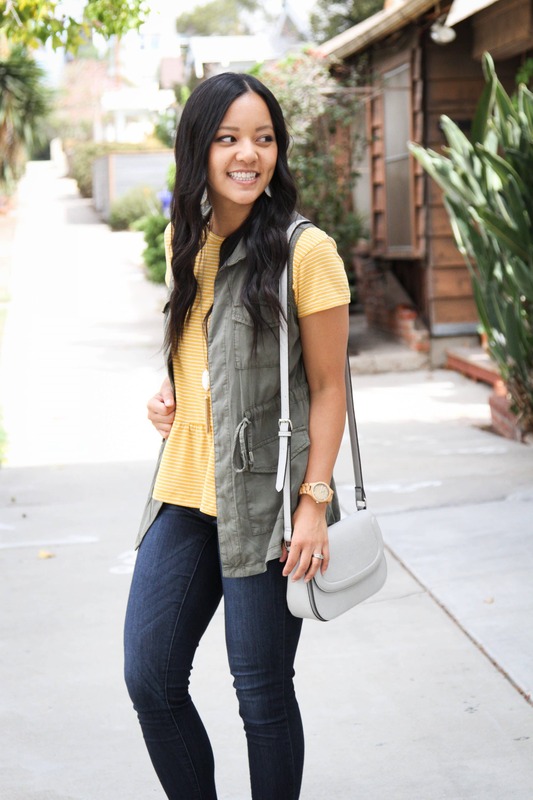 Good utility vests aren’t always easy to find at a decent price, but once in a while you’ll find a fantastic one from Target, Kohl’s, JCPenney, or Old Navy for under $30. Otherwise, you can find some really great ones at Nordstrom year round, but they are way more expensive. Recently I’ve been sharing about the awesome utility vest from JCPenney. It’s incredibly affordable since JCP runs sales all the time. (Wait for it to go between $21-$35.) It’s also ridiculously soft, which is important as many utility vests are too stiff and not comfortable to wear all day. If you want a thin one, this JCP one is fantastic. For some reason it’s not available for shipping online and only for store pickup, but you can check if you can get your size at your local store HERE! There are a few other utility vest options at the bottom of this post, but I haven’t tried them all firsthand, so read reviews! Alright, now let’s talk through some outfits with a utility vest! 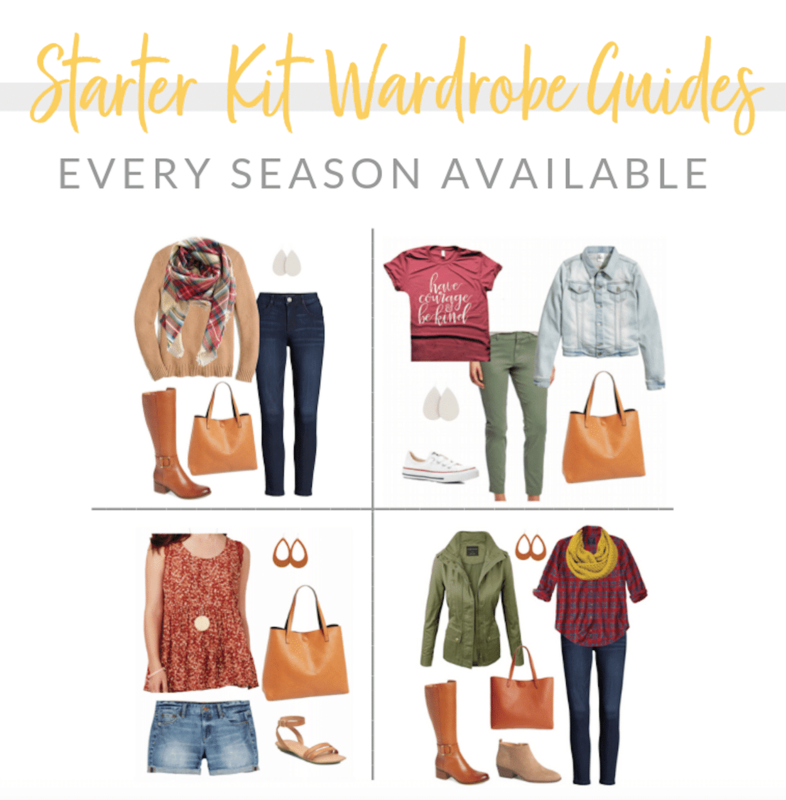 First up is the option for the warmest fall weather—basically for those who have summer weather during fall. 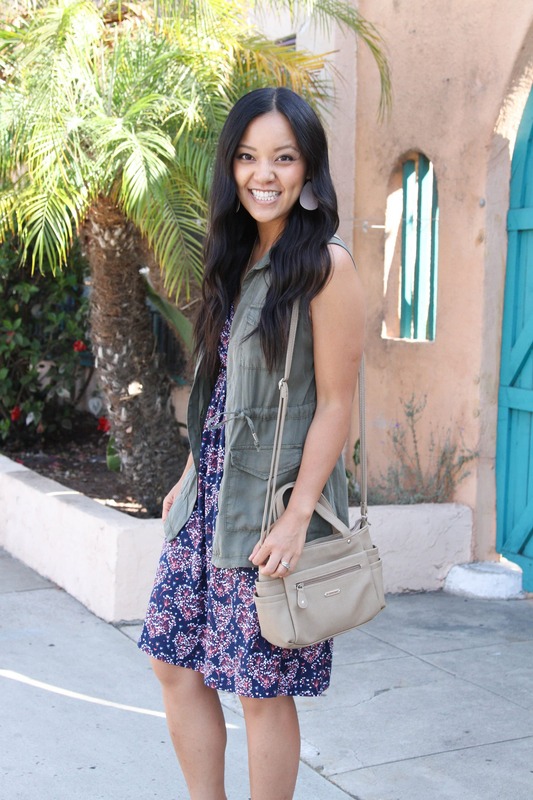 😛 You can add fall feels to those summer dresses by throwing on a lightweight utility vest! 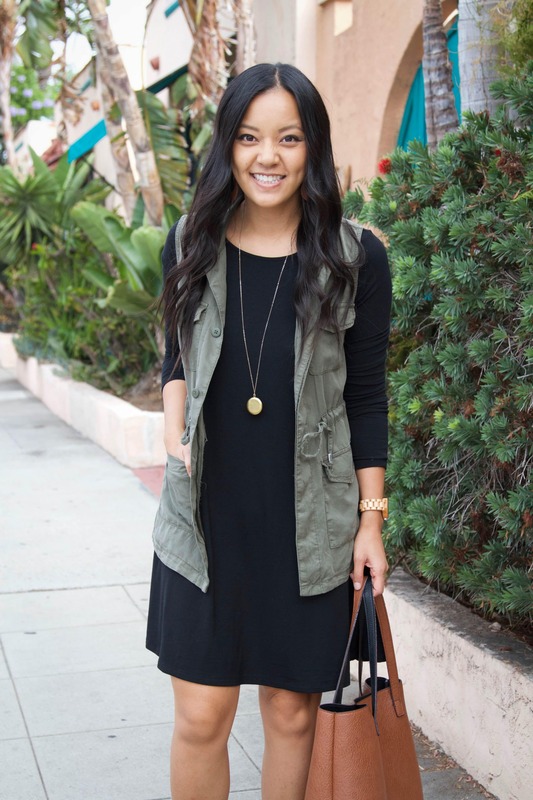 And yes, you can totally wear a vest with sleeveless tops or dresses! 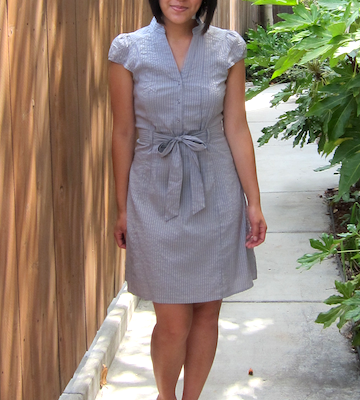 BTW, this dress is breastfeeding-friendly thanks to the cross front. This exact is sold out, but it’s available in a few other prints HERE. It’s extremely comfortable, stretchy, and CHEAP! I got it for $14!!! 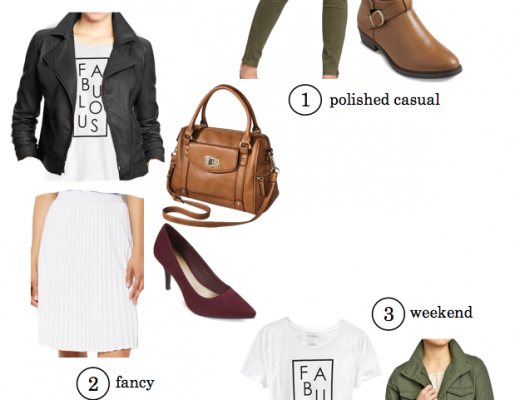 Since olive is a pseudo-neutral, it goes with quite a lot of colors. Wear it with bright yellow, orange, pink, purple, or blue. It’s so versatile! 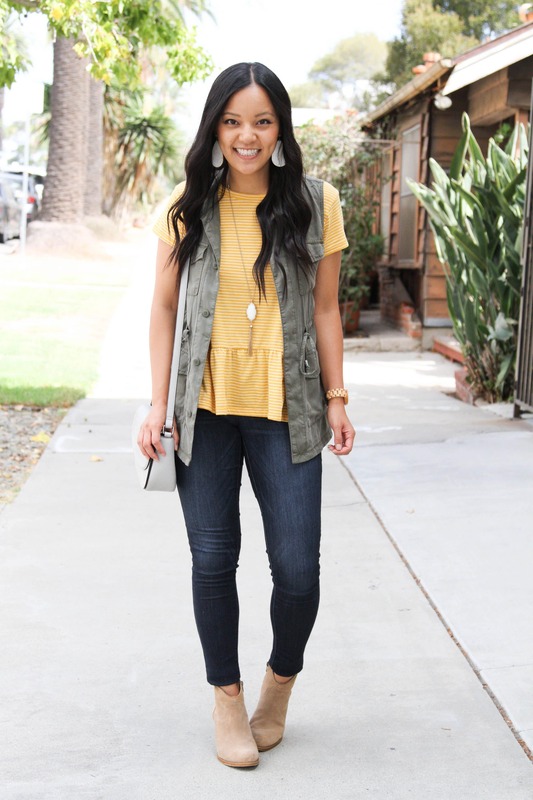 I love it with my yellow peplum top, which has been a favorite in my closet since I got it this spring. 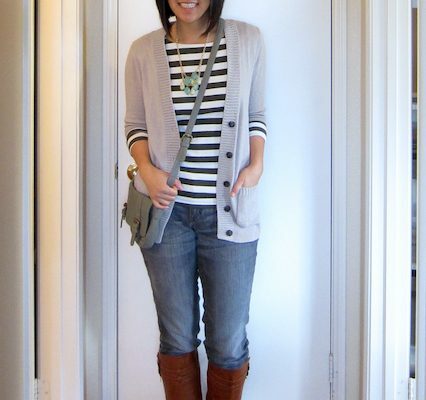 I wore it through the summer, then styled it here for early fall with jeans, booties, and a utility vest! 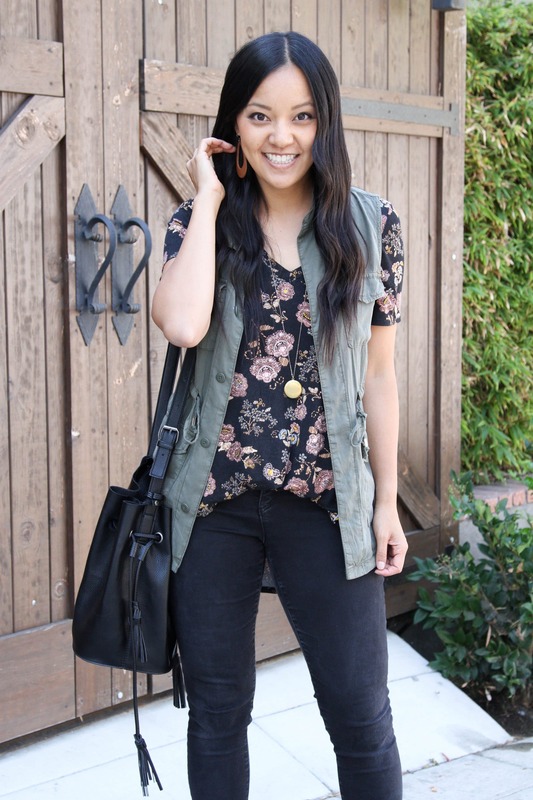 A utility vest works great over printed tops. Printed tops effortlessly make outfits more interesting, and the vest is an easy but lightweight piece to throw on and take the whole outfit to the next level. This top is soooo soft and stretchy. It’s so stretchy that it’s easy to breastfeed in by pulling down the neckline. I usually can’t breastfeed in v-neck tops, so I’m confident that if *I* can do it in this tee that most others can too. It comes in several colors and prints HERE. I’m wearing size M.
One heads up is that it’s pretty long. It makes for great front-tucking and the back works okay with long oversized cardigans or even this longer utility vest. But it can be weird to wear with shorter completer pieces, so in those cases I’ll tuck the back of the top and blouse it out a bit like I would to the front. Of course, you can wear it with a long sleeved dress too! 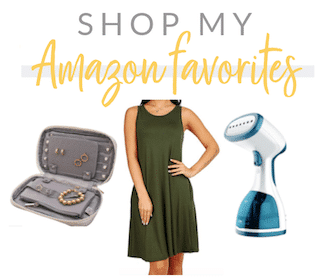 You know I love my pajama swing dresses, and a utility vest adds a little bit of necessary structure to these super flowy and kind of shapeless (but extreeeeeemely comfortable) dresses. 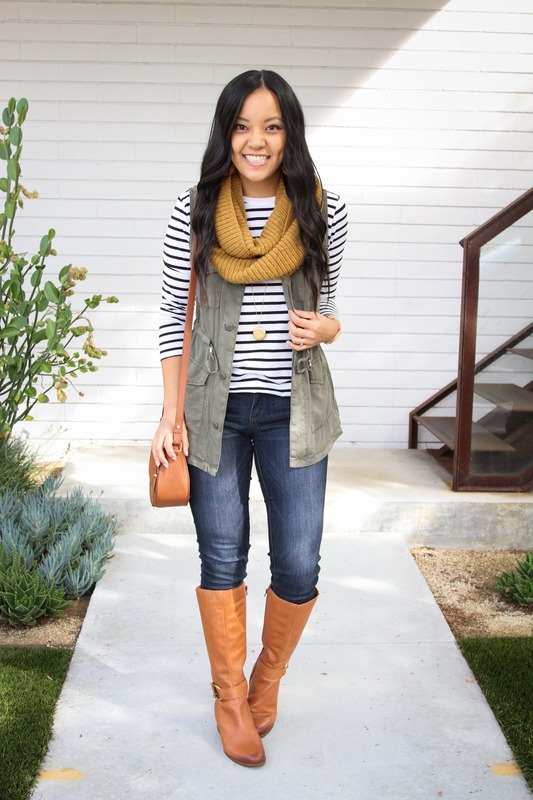 Lastly, the vest looks cute with a long sleeved tee—preferably a striped one! 😀 (You can wear a vest with a short sleeved stripe tee too, but I wanted to show a long sleeved tee outfit since I’ve already shown a couple outfits with short sleeves.) 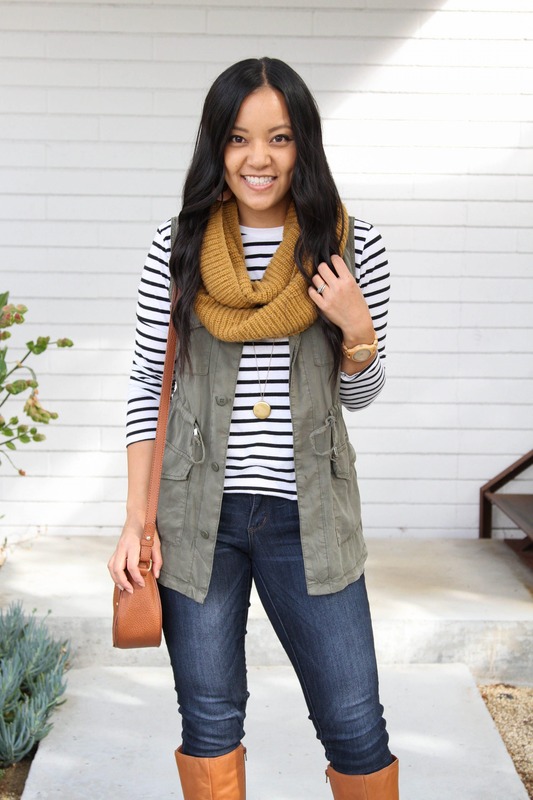 If you want to wear a vest but need more warmth, wear it over a sweater! I hope that gives you some ideas for how to wear a utility vest. It seriously goes with so much! 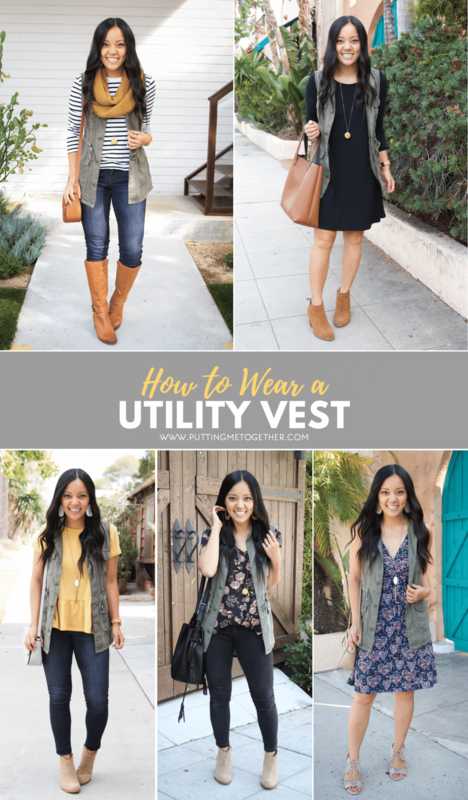 For even more ways I’ve worn a utility vest, click HERE! Below are a few utility vest options. Again, I haven’t tried them firsthand, so read reviews. Good luck! P.S. The next round of FASTer Way to Fat Loss starts Oct 15th! Read my two posts about it HERE. I have a 2 vests but they are not olive green, but Navy and Blush both from Amazon. Do they HAVE to be green? I find that the green colored ones are SO MUCH more pricier than the other colors. I have a green jacket from ON, but haven’t been able to find a green vest that fits and/or super pricey. Of course not! 😁 You can do any of these looks with any color vest. I mostly focused on shapes, like sleeveless or short sleeves or long sleeves. You can do that with any colors. 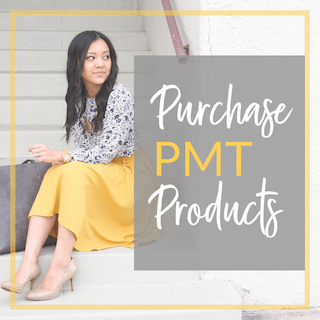 I love my Pleione utility vest from Nordstrom!